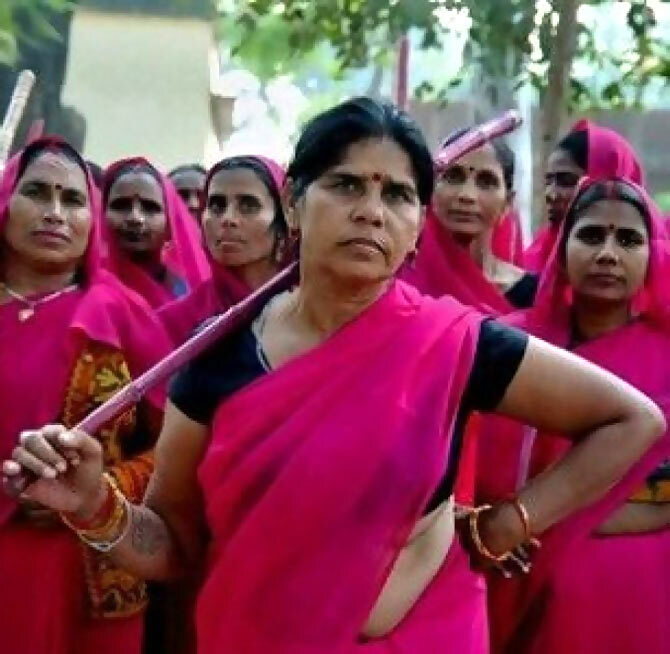 Gulabi Gang leader Sampat Pal Devi tells her story. Fifty-year-old Sampat Pal Devi is very upset with Madhuri Dixit. The film Gulaab Gang is based on her life, and Madhuri’s character is based on Sampat. But Sampat never got to meet the star even once. “I will stop the film no matter what,” an aggrieved Sampat Pal tells Patcy N over the phone from her village Badousa, in Banda district of Uttar Pradesh. She also speaks about her remarkable work in getting justice in her remote village, how it all started, and the group of women she has empowered over the years. 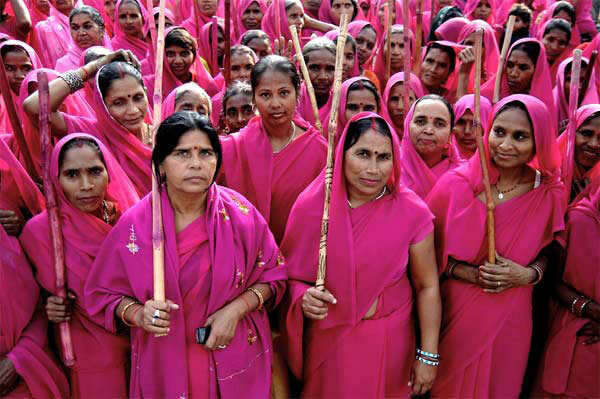 There are many documentary films made on the Gulabi Gang. One was made by a madam from London called Kim (Kim Longinotto), in 2010. It is called Pink Sarees. Another was made by Nishtha Jain called Gulabi Gang. Now a film has been made called Gulaab Gang. Woh Madhuri Dixit hain. Woh chori chori bana liya. Humse permission bhi nahi liya. (She is Madhuri Dixit, and has made a film on the sly. They haven’t taken permission from me). If they release the film, hum unpe mukdma kardenge (we will sue them). I will stop the film no matter what. Without my permission, they can’t release the film. I have already filed a case against them. They have written two or three letters, but I can’t read their letters. My lawyer Kush Sharma reads the letters. There is a serial called Lakhon Mein Ek (the series is based on true life stories, on Star Plus) made on me. In that they show that my husband beats me. My husband never raised a hand on me. These people don’t meet me and make anything. Television and films distort the truth about my life. Yeh filmi duniya wale, banale kuch bhi nautanki, mirch masala lagakar (Filmmakers add spice to the story). Madhuri Dixit never met me! I was born in Kairi village in Banda in Uttar Pradesh. My parents were farmers. I am the eldest daughter. I have a younger sister, Urmila Pal. My brother Ramlal Pal became a saint at the age of eight. My other brother Shiv Naresh Pal is educated. He did a double MA and works for LIC. I did not get an education. I mostly studied from my brothers’ books at home. There was no school in my village and my parents would not send me outside the village to study. My uncle, who was educated, taught me to read and write. I went to school for just two years. I was 12 years old when I got married and was sent to Raoli village in Kalyanpur in Uttar Pradesh where my husband lived. My husband was 25 years old, I think. I don’t remember properly because I was so young. He was a farmer; my in-laws had a farm. Later he started selling ice-cream from a cycle. I had my first child at the age of 15, a girl. We named her Prabha. I had four more children -- Prabhavati, Champa, Kanta Prasad Pal, and Nisha. All my kids are married. I started the group when I was just 20 years old. Our village is very remote and underdeveloped. People were not educated. Men did not treat women well -- they were lower than shoes for them. That angered me. After all, women are human beings too. Why should we be treated differently? Before marriage, at our mothers’ place, we are treated so well. They love us even if they don’t educate us. But once we come to our in-laws’ place, we don’t get to eat first: the men of the house will eat, then the daughters of the house, and then the daughters-in-law. Watching all this, I would lose my cool. I would retaliate. I would fight for my rights and would forcibly do things. My social work started at home. I stopped waiting for anyone and started eating first. Whatever I did was to change the discrimination in the house. I wanted to change old and bad traditions. Slowly, I started getting knowledge and I started fighting for my rights. I understood that you don’t get things easily, you have to use force. By using force, I started getting success. To start any kind of revolution, it is necessary to start at home. When someone starts any kind of agitation, you know that they have felt some kind of repression at home first. One day I was walking home when I saw a man beating his wife. I told him to stop and yelled at him. He started fighting with me, so I had to leave. The next day, I went to his farm with five women. I pushed him and hit him. He fell down. I started shouting: ‘Dekho ye hume maar raha hain!’ (Look, he is beating us). We tricked him and beat him up. All the women saw it was working and they started joining my agitation. Since that day, the men in my village never raise a hand on women. Slowly I started taking my movement to other villages. This was in the 1980s and there was no name and no gulabi saris. I had to leave my in-laws’ place because I was working for a social cause and they didn’t like it. They threatened to beat me up. My husband and I went to another village, Badousa in Banda district. That is when he started selling ice-cream. Initially, my husband did not support me. But I made him understand. I told him he was duty bound to help me. At the most he would have thrown me out of the house. I had decided that if he told me to leave, I won’t go to my mother’s house. I will work and take care of myself. God has given me hands and feet. I can work. I don’t have to rely on anyone. I wanted to teach women to be independent, so I myself worked in an anganwadi (child health care centre) for some time. Later, I taught women stitching. I taught them how to make pattal (plates made of sal or banyan tree leaves). Now I don’t teach anyone anything. They have learnt and they do things on their own. Now I only help women victims and they join my gang. On February 14, 2006, when we became a big group, I thought we should have a name and a dress code. We pooled in some money and went to Kanpur to buy saris. I thought if we choose blue we will be taken as BSP (Bahujan Samaj Party) supporters, and if we choose yellow, we will be taken for some religious group. We chose gulabi (pink) because that was not taken by any group or party. Since we all wore gulabi, we called our gang Gulabi Gang. We don’t wear pink saris all the time; mostly when we go out together. Once we had a name, we started facing problems from the police. They didn’t like us being a ‘gang’. ‘Gang badmaasho ka hota hain’ (gangs are made up of thugs), they said. We told them that there are so many other groups who also have gangs like the PWD (Public Works Department) workers, who have a gang. One day we beat up a police officer for keeping a man in the jail for 11 days. I told them if he is wrong, you file a case against him. If he is not an offender, leave him. They got upset and said, ‘Tumhari jaisi neta pachaso aati hain’ (There are lots of politicians like you). I did not like his taunt. The next day I went to the police station with 300 women. The police got angry and hit us with their batons. We attacked them and beat them up. I had no knowledge of law. I did not know that you should not beat up a police officer (laughs). They filed cases against me. Once, we gheraoed (surrounded) a government officer. It was during a thana divas (thana divas are held in police stations to resolve public grievances). I was talking to an officer about the condition of our roads. He called me batameez (ill-mannered). I told him, ‘You are batameez, you don’t know how to respect women’. We started shouting slogans and gheraoed him. He apologised but I asked him to get the road done. He agreed and kept his promise. Once, I went to the bijlee ghar (electricity office). There was no electricity in our village for 15 continuous days. I told a man sitting there about our problem. He said it was not his job to look into the matter. I asked him to vacate his chair. He said he wouldn’t. So we locked him in his office, and soon after, electricity was restored in my village. When I go around with my lathis for justice, people do threaten to attack me, but nothing has happened yet. I don’t get scared. Nowadays, there is peace and no need to do much in my village or neighbouring villages. Some days there are 10 cases that I have to deal with. There is not a single day when there is no case.